One of the important things about being a fifth grade teacher is teaching kids how to be organized. Unfortunately, many kids still rely on teachers to remind them to finish an assignment or to take a note home. While many students aren't ready to be fully independent, there are some things that I do to help them take those steps towards independence. Unfortunately, I don't have any pictures for this post, but I'm hoping that you can visualize what I do. The two buildings that I have taught in both invested in student planners for every student. It is a spiral-bound calendar that closely resembles a lesson plan book. In the front, we have included the student handbook (school policies, dress code, school calendar, etc.). The following pages are weekly calendars. The days are across the top and the classes are down the left side. At the beginning of the year, I walk through the calendar pages with the students and have them write in no-school days, early dismissal days (you know, the fun stuff), open house, the first several PE days (so they can bring appropriate clothing), and anything else we currently have on the calendar. On a daily basis, I have the students fill in their planners with the day's topics. Here is one that I just made up in a spreadsheet as an example since I don't have an old planner. I also have a planner, and I use my document camera to project it so they can copy it into their planners. This is what they might see on a Monday. Sometimes teachers have students write the work they will be doing that day, and some that don't have a lot of assignments have students write in I Can statements for the day (like in Science in this example). So here's what might be going on for this Monday. In Literacy, they will be doing some word work and reading chapter three in a novel. Maybe a vocab foldable will be part of the word work, and it will be due on Wednesday. Any homework, even it it's just what they're doing in class, is listed in the planner with an HW on the day it is due. After the assignment, students write "do" if they still have to do it, then add the "ne" to make "done" if they've turned it in to me. Many of you have told me that you are not allowed to give homework, and to be honest, I don't give much homework either. But sometimes students don't have enough time in class to finish an assignment, don't use their in-class time wisely, have band or chorus during study hall, or don't use their time in study hall at all. I consider any assignment that I expect them to complete and hand in as "homework," even if I don't expect them to take it home. For those papers and things that I want them to keep in their desks because we use them as reference or we haven't finished discussing them, I have a color-coded system. Each student has red, orange, yellow, green, blue, and purple 2-pocket folders. 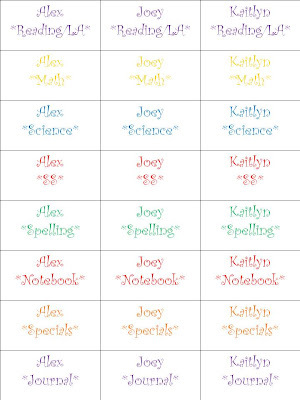 I print out labels that has the students' names and subject area on them in the appropriate colors. Wow, the colors in that picture are really horrible. Anyway, I cut the page into strips and each student sticks the labels on the appropriate-colored folders. The "notebook" and "journal" ones go on their spirals. This saves me a lot of time tracking down the owner of something, and it reinforces my color-coding. So if we are working on a Native American graphic organizer and don't finish, I say, "Put these in your red folders." The folders stay in their desks. Now, this past year in the middle school, we tried putting their folders and everything else in a 3" binder. Same color-coding, but now the folders would travel with them. The thought was that they could always have what they needed in order to work on assignments during study hall or at home. However, about seventy-five percent of my students just crammed papers into their binders, not taking the time to put them in the appropriate folder, even with reminders. And they certainly weren't pulling out assignments during sixth-period study hall to work on them. Great tips! I will definitely be adding "do" and "done" to our agendas. Thanks! I always love reading your posts Diane. I think I've had enough of binders this past year too, for similar reasons. I do like the idea of the folders and love the color coding (this is something I am working heavily on for next year). The student planner is great! I've been working on one for homework for my students next year but hadn't thought of writing in the classwork as well. You've given me so much to think about, thanks Diane!! I hate those big binders for the reason you mentioned. When I was in middle school, we were required to have a specific colored folder AND spiral for each class. ELA was blue, Math was red, Science was green, Social Studies was yellow. And then we all had a Take-Home folder, which could be a fun design. For each class, we'd simply look for the corresponding color in our lockers, and it was easy for teachers to see that everyone had the right materials. Someday, I'd like to work with a team of teachers who will implement this! Wow! Great minds think alike. I also use the the color coding system and wrote about it for this week's link up too. :) I like the individual folders best also. The binders take up so much room in their desks and the kids don't seem to put them to good use. We do use a binder for homework which has a homework folder and the student planner in it, along with other goodies for students to use. I don't have kids write down the classwork, but after reading your post I am thinking it would be a good conversation starter at home if parents could see what was accomplished each day. Something to think about. Thanks for sharing! 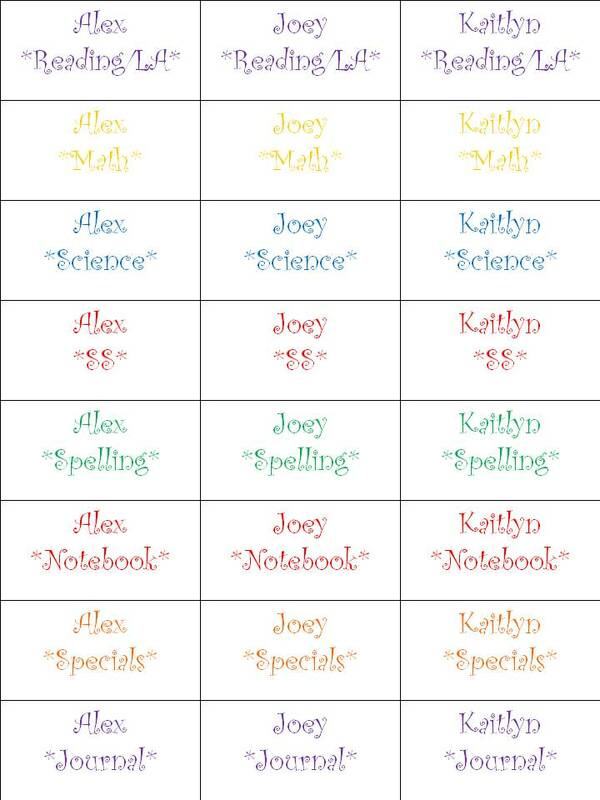 Diane--I use a planner to project onto the smartboard for the kids to copy as well. I love it, because I always have it to photocopy for kids who are out sick, among many reasons. Great post! I love the Do/Done idea. Great ideas, thanks for posting!